SMN report: Those Imperial fighter jocks might be waiting a long time though, as 'home' could be a long time ago in a galaxy far, far away. So that means a Doctor Who-style time and space pickup truck could be needed. 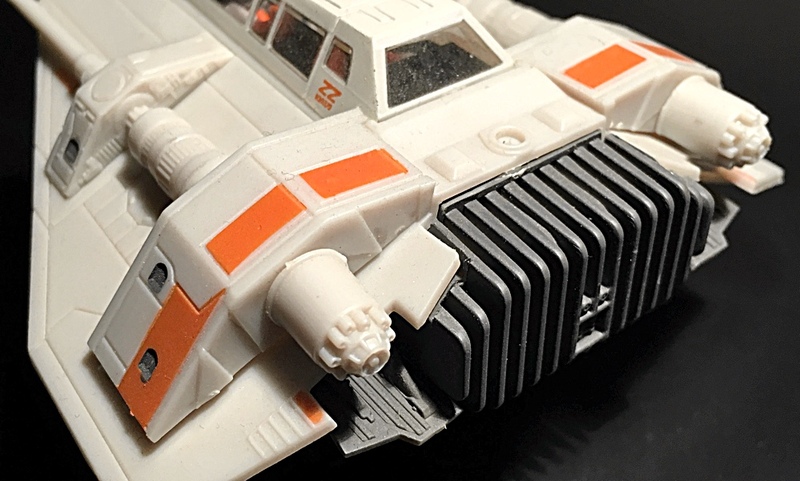 Meantime, Star Wars stuff continues to pour off the product lines of model companies across planet Earth. And large or small, they all help to feed what has to be cinema's largest franchise ever conceived. Star Wars has become a huge media money machine, known as the Star Wars expanded universe. It includes books and comics, TV series, computer and video games, and of course, toys and models by the million. Star Wars holds the Guinness World Records title for the most successful film merchandising franchise, and by 2012, earnings were reckoned as more than $30 billion USD - yes, that’s billion. As for models, here are a few that happen to be parked at the SMN StarBase. 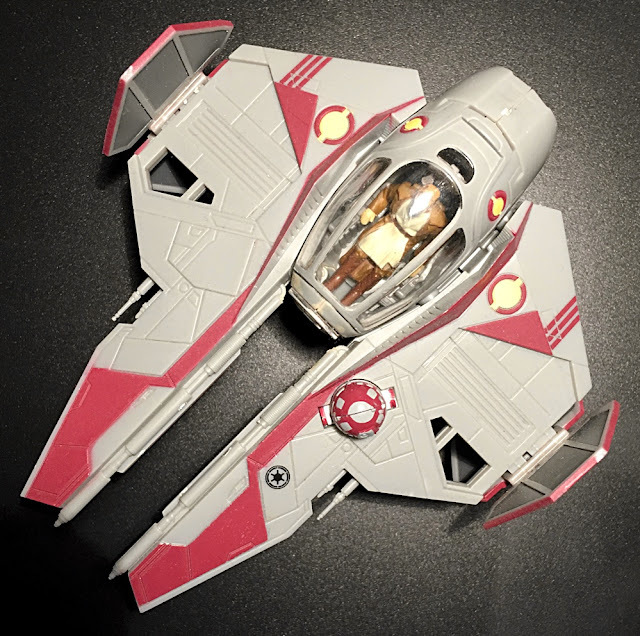 The Obi-Wan Starfighter (below) is a Revell Snap Tite kit that goes together in a few minutes. No scale is quoted, but judging from the size of the included pilot figure, the spacecraft is about 1:48 scale, handy for display purposes. 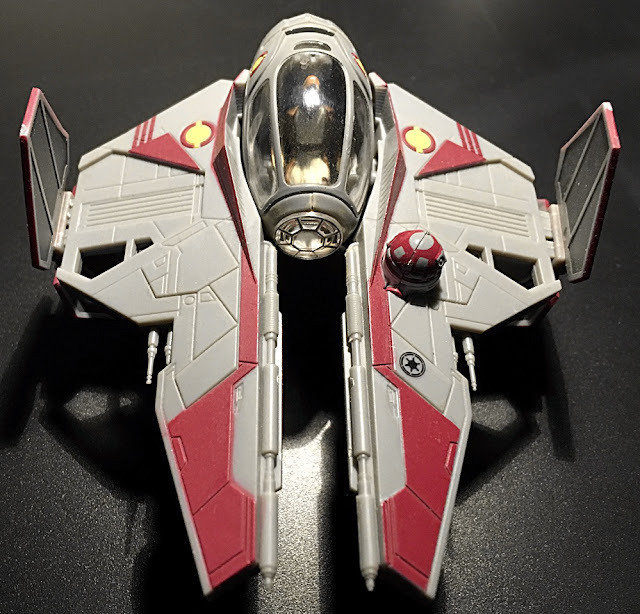 The Obi-Wan Starfighter (below) is a decent little kit, with no real assembly issues to speak of. The components are pre-coloured, as is Obi-Wan himself. 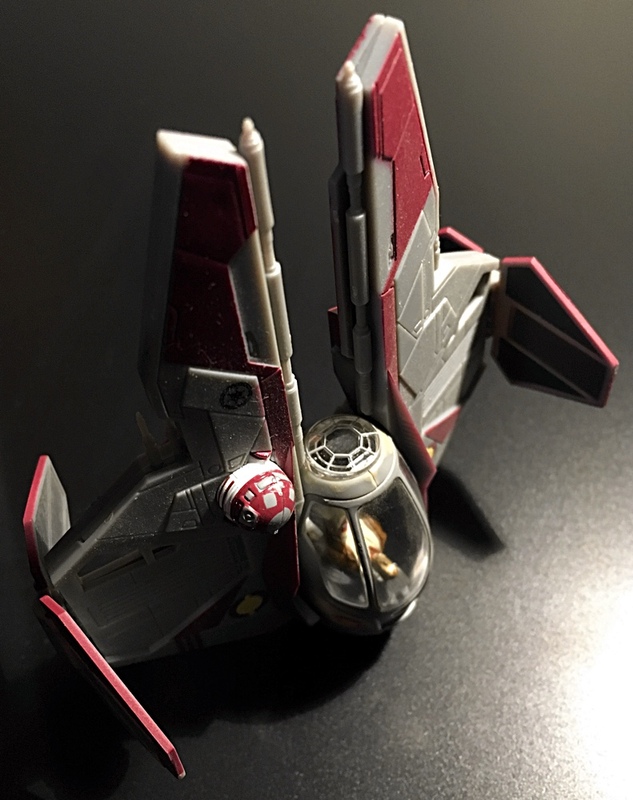 The transparent canopy (below) allows you to see Obi-Wan clearly. He sits in the semi-reclining position that's suitable for fast manoeuvring. If you are short of display space, the Starfighter (below) can be parked on its tail, to sit vertically. 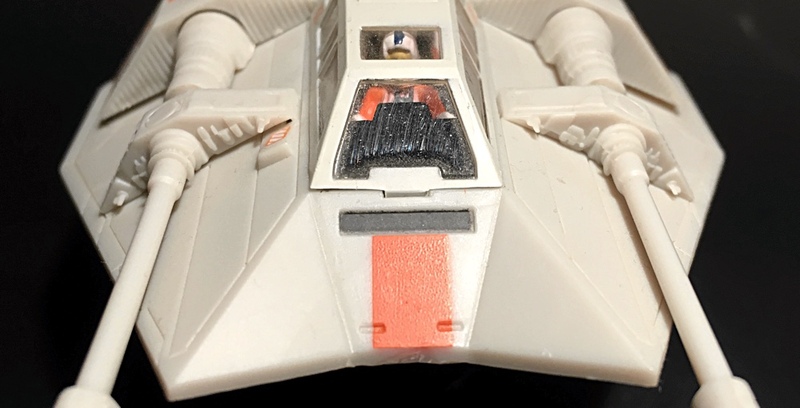 Detail extends to a pair of crisply moulded exhaust tubes (below) in the tail cone. As always with a pre-coloured kit, the basics are supplied to help you achieve a good result with minimum time and fuss. But a kit like this does benefit from extra care, with added painting and some subtle weathering to bring out the realism. 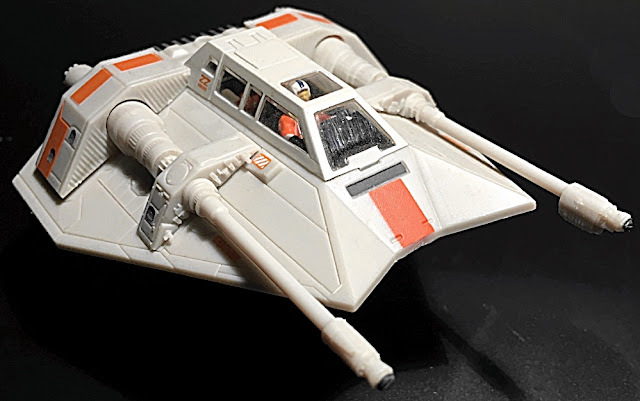 Another Revell Snap Tite kit, the diminutive Snowspeeder (below) is to approximately 1:72 scale. 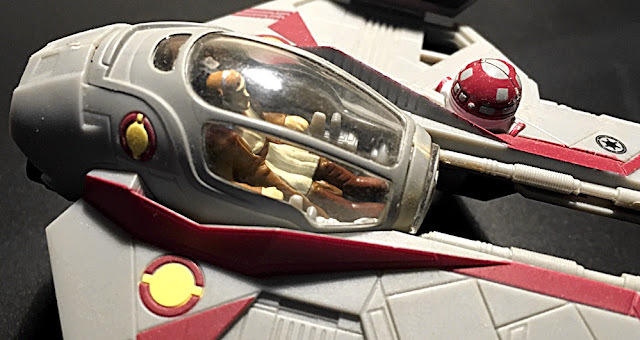 Two figures are supplied inside the tiny cockpit. Flat window areas make it easy to see inside (below). 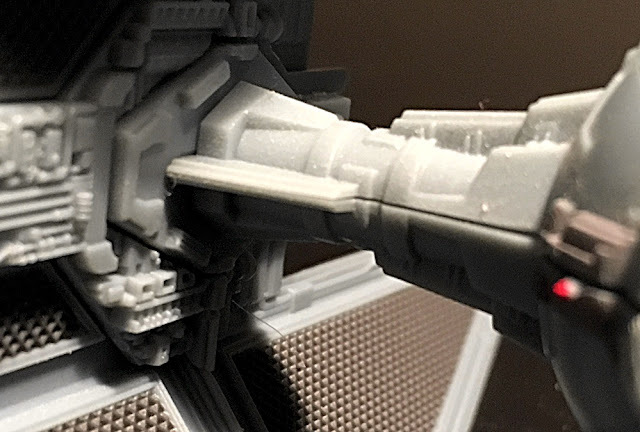 The laser cannon on each side need a little pressure to fit nicely, but once in place there are few gaps. 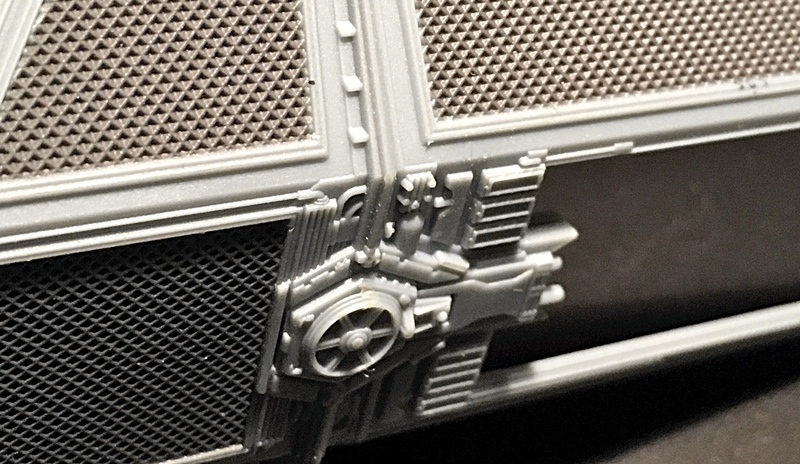 Crisply moulded radiator detailing at the tail (below) is as good as some kits costing much more. 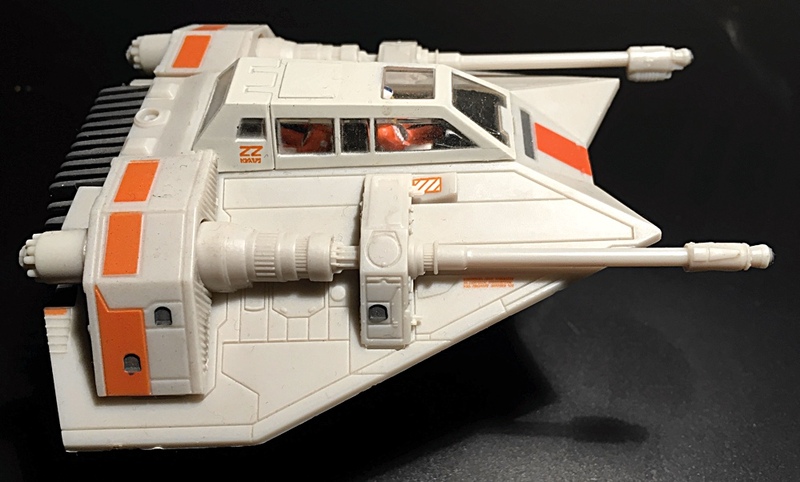 All the Snowspeeder needs is a little carefully applied grime, and it would look highly realistic. 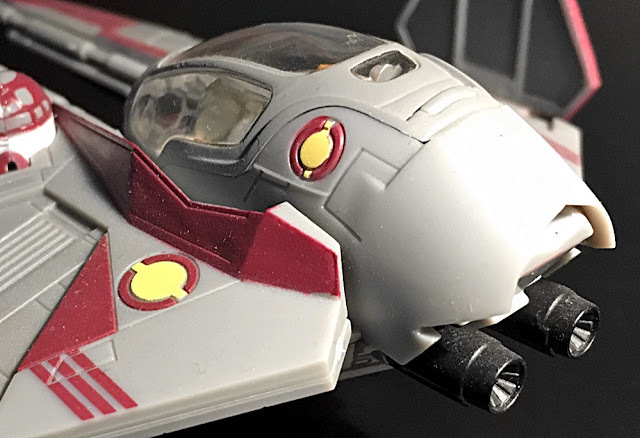 The parts in this kit fit very snugly indeed, so if you wish to add detail to the cockpit area, make sure you do so before you fit the canopy in place. Fitting it is a final act - you'll never get it off again. 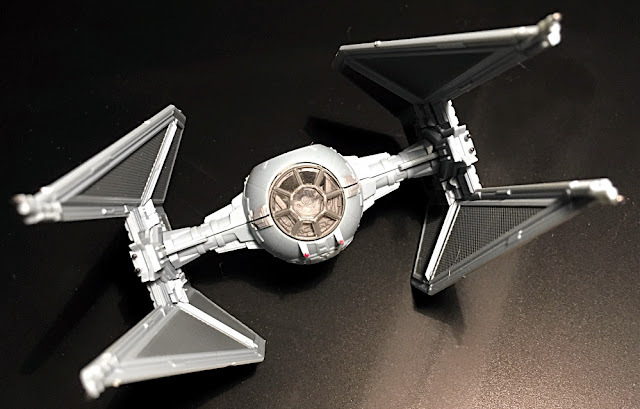 Last kit in this Snap Tite trio is the TIE interceptor (below), which does not have quite the snug fit of the other two. Again, the dimensions take a little guesswork and we'd pitch the model at around the classic old-style 1:96 scale. 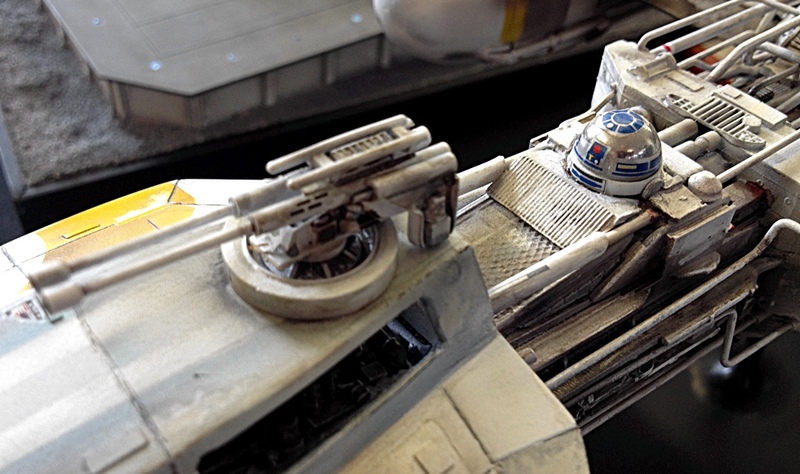 So it could be shown in a 1:100 scale collection without too many misgivings. Ventral view (below) shows the spherical fuselage hub, with mini-wings joining it to the large solar collection panels on either side. The wings fit reasonably well, but their connection points are small, so for a solid fitting, you really need to use plastic cement. 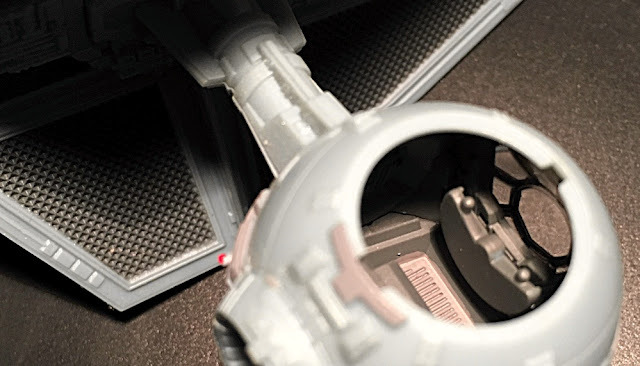 There's a modest amount of interior detail (below) that you can see when the dorsal cap is removed. Biggest problem with this kit is the fit of the central wing (below) which is not perfect. This is a very closeup pic, so it looks worse than the real thing. It's a sure-fire case for filler and/or paint to cover the gap. The same gap occurs in the rear of the fuselage pod (below) and again it's best to use a small amount of filler to remove it. Having said that, the TIE interceptor is crisply moulded, so is well worth building, especially if you assemble a squadron of them. Closeup of the starboard solar array (below) reveals Revell's attention to crisp moulding quality. 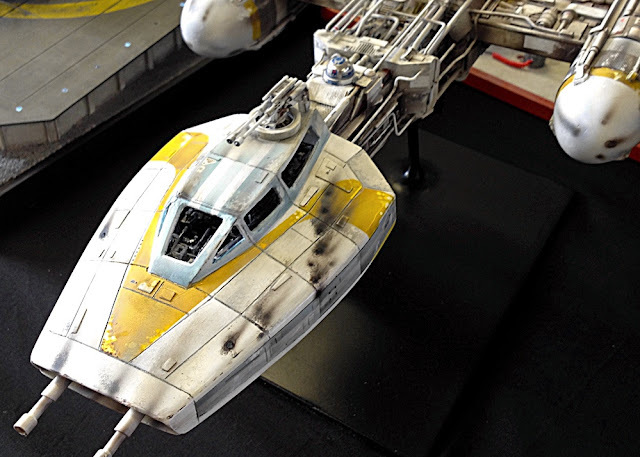 And (below) we have an example of the ultra-detail approach to model kits, as shown at the science fact and fiction Smallspace show, organised by Mat Irvine and Paul Fitzmaurice. This Y-Wing shows weathering and battle damage - and how! Flight deck closeup (below) shows an environment where you don't expect to sip a quiet cup of coffee, while enemy lasers and other deadly weapons are strafing your hull. 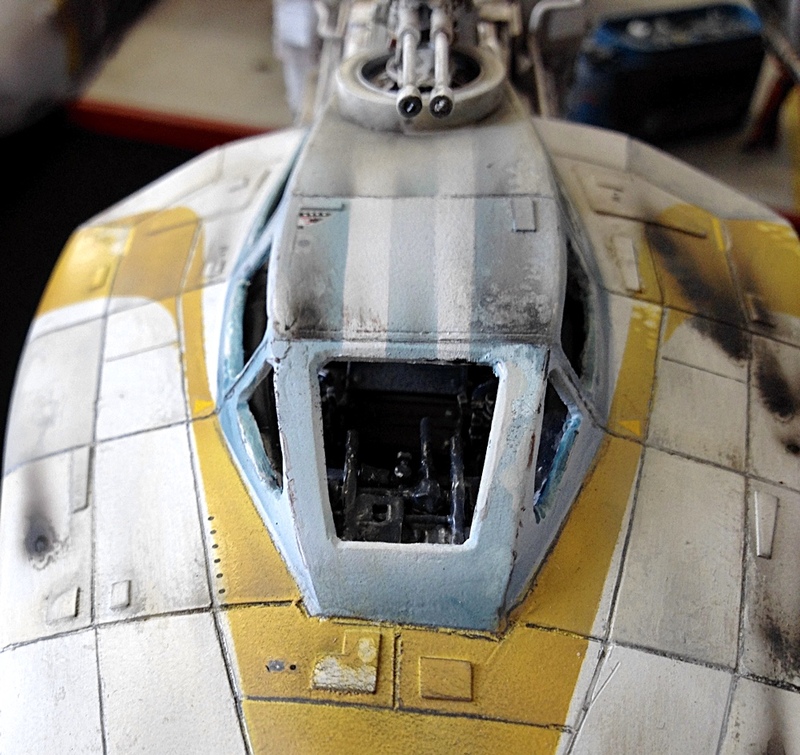 So imagine those Snap Tite Revell kits, with this amount of battle-scarred care and attention (below). Any of them could earn a show winner award, without needing a tube of cement. 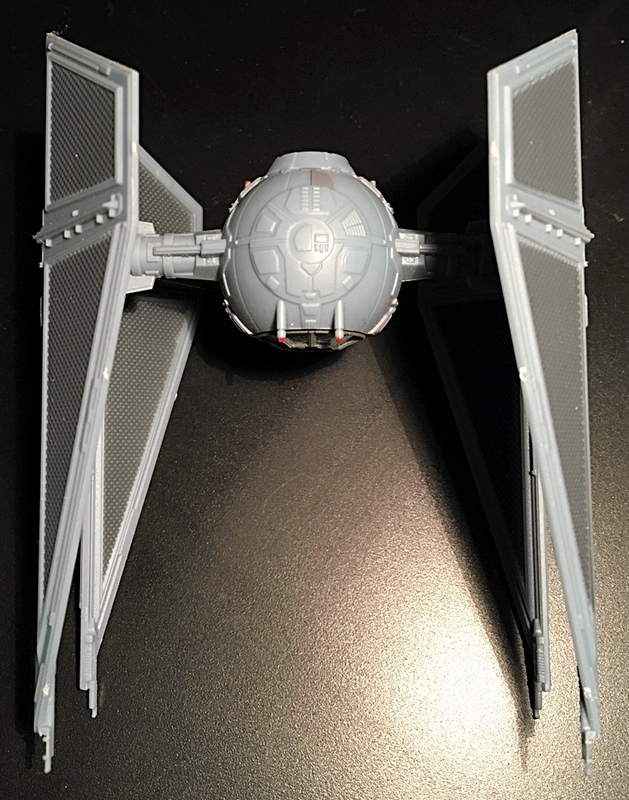 Well, maybe not an entire tube, but the TIE Interceptor certainly needs a few discreet blobs to keep those big solar cell collectors firmly in place.